Scotch Pine, also known as Scots pine, is a fast-growing, conical to columnar, medium-sized conifer with distinctive flaking orange to red-brown bark. 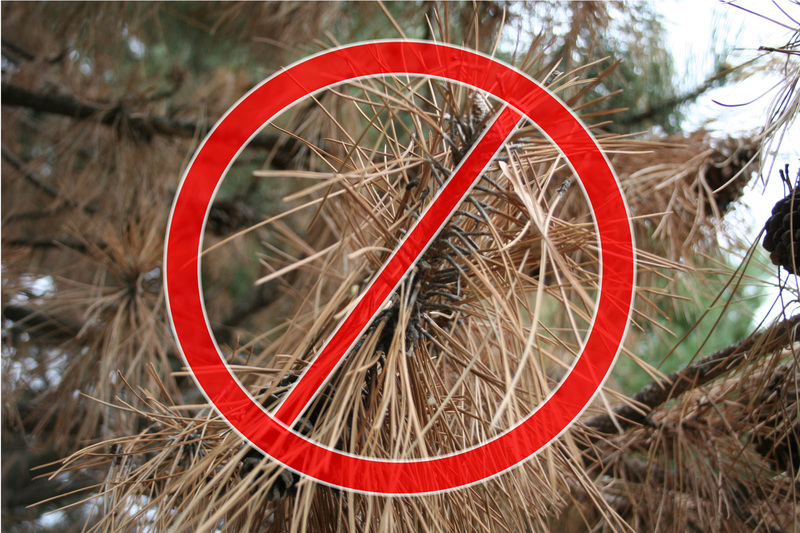 Once common and popular across the Midwest, scotch pine is being decimated by Pine Wilt and is no longer recommended for planting in Nebraska. During the 1900s, Scotch Pine was planted in great numbers in shelterbelts and communities across Nebraska but especially so in the eastern half of the state. It is relatively fast-growing and tolerant of a wide range of soil conditions. It is also drought tolerant and tolerant of urban conditions, making it a broadly useful tree. However, in recent decades, pine wilt began killing Scotch Pines in great numbers across the region. As such, the tree is no longer recommended for planting. Scotch pine is conical to columnar when young, developing an open-rounded, irregular crown as it matures and growing 30-60’ tall in cultivation. Cones are small and rounded, 1 to 2 inches long. Needles occur in bunches of 2, are stout and usually twisted, 1 to 3 inches long, and bluish-green in color. Trunks are often crooked in early years. The tree is easily identified by its distinctive orange, flaky bark on its upper trunk and branches. Scotch pine is of some importance as food and cover for many birds and small mammals. Although the plant is browsed by whitetail and mule deer, it is not a preferred forage. Scotch pine is an important lumber tree in Europe and Asia and is a popular Christmas tree across much of the northern hemisphere. Nebraska's hot, dry summers can be stressful to just about any tree including Scotch pine, which will experience a weakening of its defenses during severe drought conditions. This creates the perfect opportunity for the pine wood nematode, the organism that causes pine wilt disease. The nematode thrives in warm conditions and will complete its lifecycle in just four days. Mugo Pine (Pinus mugo) is native to the mountains of central and southern Europe where it grows naturally in a wide range of shapes and sizes from sprawling shrubs to upright trees reaching over 50’ tall. Shrub forms have long been popular as foundation plantings across Nebraska. A few tree forms, including the variety ‘Tannenbaum’ are also sometimes planted and look especially promising for western Nebraska. The species is tough and adaptable to a wide range of growing conditions but is also prone to pine sawfly damage and pine wilt disease. Scotch Pine is the only pine native to Great Britain, thus its common name. The tree has become naturalized in parts of eastern North America and can also regenerate itself in Nebraska.